Artist’s impression of the new Student Hub, which will incorporate contemporary design and stylish furniture and provide a light and spacious area where students can relax and socialise. Planning permission has been granted to develop a new single storey extension as part of a major £5million refurbishment programme designed to transform Cedar House, home to the School of Medicine. 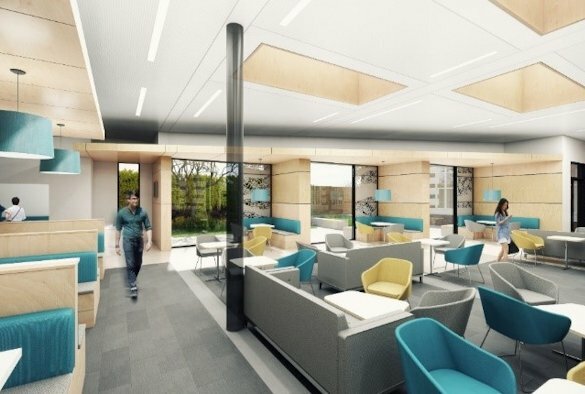 The extension will enable a new student hub to be developed on the ground floor, offering social spaces where students can relax and socialise as well as new study areas. The courtyard will also be re-landscaped making it fully accessible from the new extension, with enhanced connections between the inside and outside spaces of the building. The School will shortly be consulting with medical students to get their views on the designs for new student hub, including the type of the furniture and facilities they’d like in both the social and study areas. Work is already underway on refurbishing the six-storey building to improve its learning and social environment and create a more identifiable ‘home’ for the School’s 1,500 medical students. Investigations are also ongoing on how to incorporate simulation training facilities, so that students can benefit from enhanced experiential learning techniques. This £5million building programme is being delivered as part of Project LIVE, a £7million strategic investment project, which has already facilitated the recruitment of 100 new staff to a range of academic, clinical and professional services roles. Project LIVE also encompasses the development of new IT systems which will further enhance the student experience plus a new brand and marketing strategy. Work on the extension is due to start in January 2019, with completion scheduled for the start of the 2019/20 academic year.